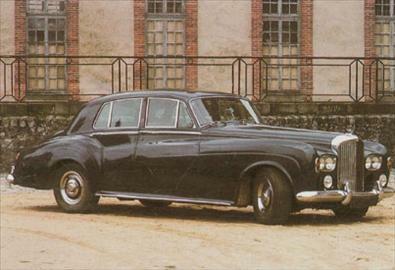 At the 1962 london motor show, bentley launched the s3. The successor to the s2, the new bentley was immediately recognizable by its double headlights, a transatlantic fashion that the usually conservative firm from crewe, england, attempted to justify in the face of press criticism. The firm claimed that the new configuration emphasized the importance that bentley attached to the american market. Subtle changes other differences were more difficult to detect. One had to park the s3 alongside the s2 to realize that the new model had a slightly lowered radiator grille and a slightly higher bodyshell, as well as a new design for the parking lights. The interior trim was somewhat different as well, with individual front seats and extra legroom in the cars back seat. sufficient power under the hood was the wet-liner aluminum v8 first seen in the s2, but with revised cylinder heads allowing a higher compression ratio and seven percent more power. As was their custom, however, bentley reservedly claimed that the power output remained merely sufficient. before the s3 was replaced in 1965 by the t series, crewe had constructed 1,286 examples of this more-than-sufficiently powerful car.